I’ve visited Clementine before, and the quality of what I found the first time around ensured that I would return. This time I elected to try the rare roast beef: top round, roasted in house, matched with a horseradish mustard dressing, marinated onions and arugula on ‘rustic bread.’ I’m never exactly sure what something like ‘rustic’ means, but I in this case it seemed to mean a roll with a respectable but not overly tough crust, and that was a touch that made all the difference. A tough roll could have easily made eating this a chore, with all manner of filling creep. But the crust was chewy yet yielding, and it made the sandwich delightful overall. The beef is tender and juicy, the dressing spicy and flavorful, (but, as always, could have used more horseradish) and the arugula well present. Look at how much lettuce is in that sandwich! That’s no obligatory greenery, friends, that’s a part of the sandwich. The marinated onions were a bit more scarce, sadly, and in a lot of bites of the sandwich they were hardly there at all. In a different sandwich that might have bothered me, but this was fine with or without them. Enough about what was on the sandwich, I’d like to note what wasn’t: cheese. I’ve spoken many times about the required slice of cheese, the inveterate sense that without a piece of cheese, something isn’t a sandwich. This is hogwash, of course, but I’ve been to more places than I can count who put cheese on everything in sight, practically throwing a slice at you as you walk in the door. Enough. Clementine is smart enough to realize that there’s enough here, that no cheese is necessary, that it would either be lost in the rest of the sandwich or simply gum up the works, and so they leave it off. That was downright decent of them, and I cannot thank them enough. 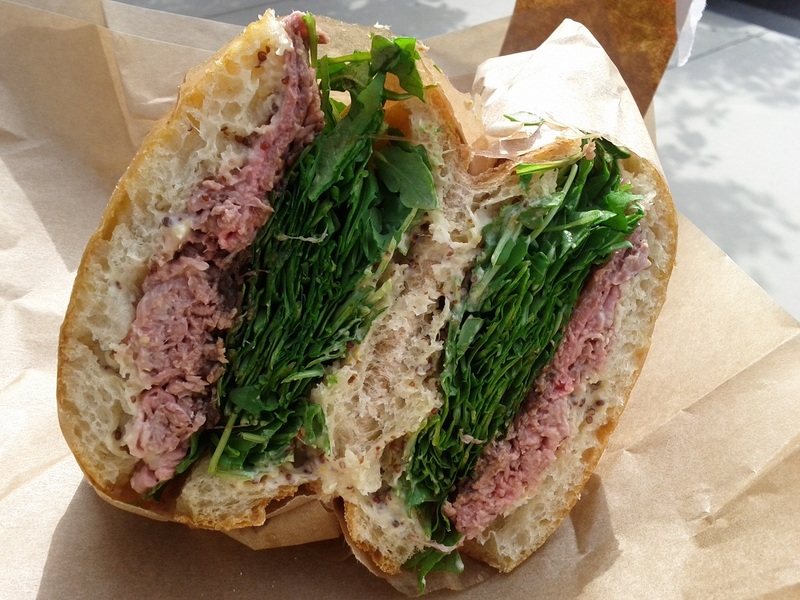 This entry was posted in Sandwich Reviews and tagged Beef, Clementine, Los Angeles, Needs More Horseradish, Reviews by Pete, Sandwiches I Have Eaten, Westwood by Pete. Bookmark the permalink. I have been away from On Sandwiches for far too long. My return sees a typlical piece which is as enjoyable a read as ever. This sounds like a sandwich I would really enjoy, perhaps with the beef more well done (each to their own). I love the comments about places that feel the need to put cheese on everything.